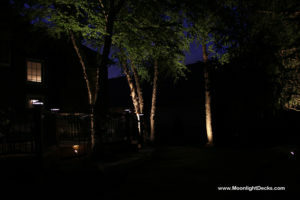 If you are looking for a way to add ambience to your backyard deck while also enhancing its appearance, the installation of deck lights may be just what you are looking for. 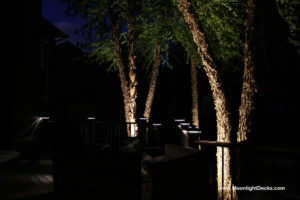 These soft LED lights allow you to add light to the dark areas of your deck and give your backyard that stylish design you have been seeking. Adding illumination through deck lights allows you to highlight the areas of your deck that you use and need light to move around in. This can provide light to steps and access areas that you need to traverse often, giving you a deck that has 24/7 accessibility and much more light than a basic porch light can offer. The relaxing atmosphere that is created through deck lights is ideal for any size backyard, as the lights are soft, yet bright enough to give you good visibility. You will make your deck transform from being somewhat drab to being a space you can’t wait to use on a daily basis. You will enjoy how the LED lights illuminate the space and give you that character that you have always wanted. The setting that is created with deck lights is perfect for entertaining in the evening, as not only will you be able to see and move about freely, but you will also have an attractive space that is inviting for guests. You will set the mood for everyone that uses your deck and create that oasis you have always dreamed of having. 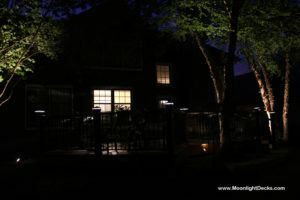 With deck lights, you will be able to use your outdoor space late into the evening. There is no reason for you to end your night as soon as it gets dark, as deck lights provide you with plenty of light to see when the sun goes down. 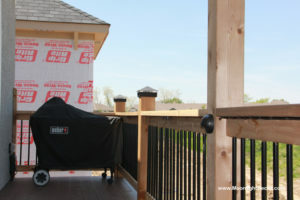 You will feel secure on your deck when it gets dark, as you will have good visibility thanks to improved illumination. The installation of deck lights is easy, as they have minimal installation requirements that can easily be carried out by a qualified contractor. The look of your deck once it has been illuminated will be a vast improvement over a deck that has dark areas that can’t be accessed because your visibility is hindered. Just think about how nice it will be to see your guests while you visit with them well into the evening! 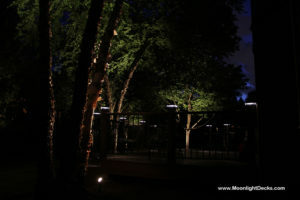 By installing deck lights, you will feel secure on your backyard deck when it gets dark, as you will be able to see freely into the evening hours. The entire area of your deck can be illuminated with deck lights and make you feel better protected, as you won’t have to be fumbling around in the dark, unable to see. Thanks to deck lights, you can have the backyard deck you have always dreamed you of having and will be able to use it even when the days get shorter. An illuminated backyard deck provides the perfect way to enjoy the evening, as you will have the right amount of light to see and appreciate those around you. 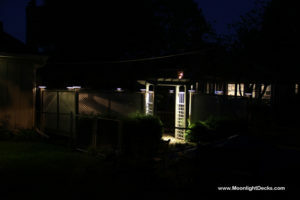 To purchase deck lights, contact Moonlight Decks LLC. 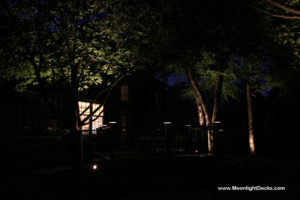 We can light up your deck in a way that you never imagined and give you that ideal space to enjoy all year long. 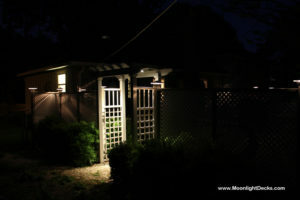 If you are looking for a way to add some additional security to your home, deck lights are just the feature you need. They provide illumination under the cover of darkness and can make those areas around your home that are susceptible to break-ins safer. 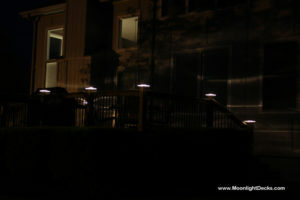 With deck lights, you will add light to dark areas that make it easy for a burglar or thief to go unnoticed. By adding light, you will stop trespassers from entering your property and give yourself that peace of mind you have been looking for. Dark spots on your deck can make it easy for a thief to sneak onto your property without being seen and access your home without you knowing it. A well-lit deck, however, means that thieves will easily be seen, and this can stop them from gaining access to your home. Some well-placed deck lights should be enough to stop anyone from thinking about coming onto your property with the fear of being caught. A thief knows too well how light can give away their cover, and with deck lights, you will be able to illuminate all areas of your deck, making it harder for a trespasser to feel comfortable entering your property. 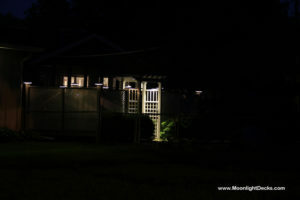 Deck lights are all that is needed to light up those dark areas in the back of your home that are prone to intrusion. This added security will make you feel more comfortable in your home, as you know all areas on your property are well lit and easier to view. Deck lights provide more light than a simple porch light, and can illuminate all areas of your deck and backyard to discourage theft. The added security you get from deck lights can make you feel more at ease and allow you to enjoy your deck at all hours of the day and night. You will also be safer on a deck that is illuminated with deck lights, as you will be able to move about with ease and don’t have to worry about losing your footing in the dark. Steps can be precarious in the dark, and can make it dangerous for you and your guests to move around. Thanks to deck lights, you will be able to see easier and feel safer during the evening hours, allowing you to enjoy your deck no matter the time of day. 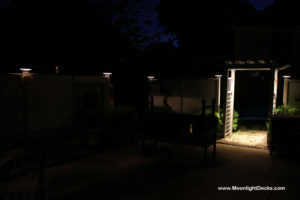 Plus, the lights don’t attract bugs, which makes using your deck in the evening a lot more pleasurable. 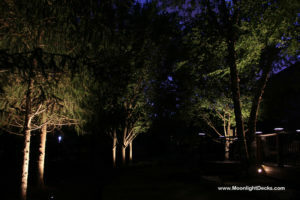 Deck lights are the perfect way to light up your backyard and deck. 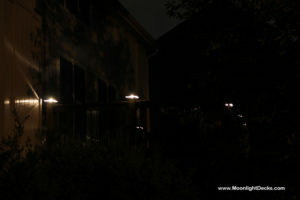 They provide the ideal amount of illumination to make you feel safe and secure at night. 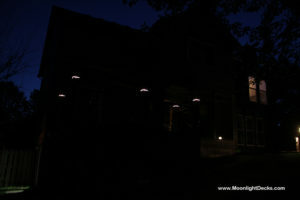 To purchase deck lights for your residential property, contact Moonlight Decks LLC. We have a variety of deck lights available, including post cap lights, that are designed to protect your deck while providing you with essential light. Come see us to check out our selection! Provides safety: This is probably the most important benefit of adding outdoor deck lights, as it can prevent falls and injuries from occurring. No longer will you have to fumble your way around in the dark or navigate your way in total blackness on tricky stairs. 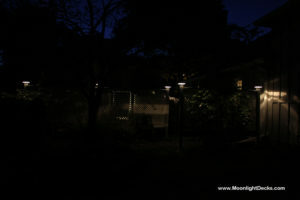 Outdoor deck lights will guide the way and give you that extra bit of safety so you can see where you are going. These lights give you enough brightness that you can see all hazardous areas and ensure you have good footing so you don’t get hurt. Add decoration: Outdoor deck lights will give you that amped-up look that can transform your deck from boring to festive in an instant. 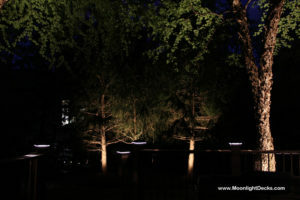 You will adore the appearance of these lights and the decorative touch they provide to your outdoor area. 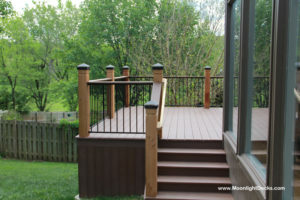 This is an easy way to give your deck an updated look without rehabbing it in its entirety. Enjoy evenings longer: How many times have you been enjoying the evening on your deck and had to call it quits because it got dark? 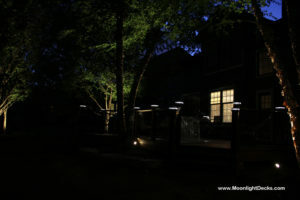 With outdoor deck lights, you will be able to extend your relaxation well into the evening, as these lights will illuminate your deck and make it an environment you can enjoy well into the night. Plus, it eliminates the attraction of bugs to your deck, making the evenings that much better. Prevents rotting: Adding outdoor deck lights can even protect parts of your deck from weather-related damage. By placing these lights on your wood end caps, you will save them from the elements and eliminate that rotting that always seems to occur. 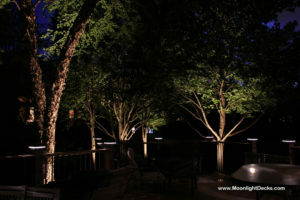 These lights will help you give new life to your deck and ensure you can enjoy it for many years to come. 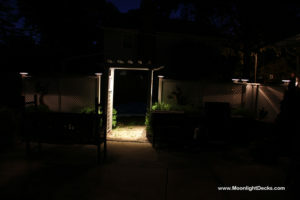 Low maintenance: One of the best things about these outdoor deck lights is that they are low maintenance. You won’t have to do costly upkeep to keep them running, and their low voltage is efficient, making them ideal for everyday use. 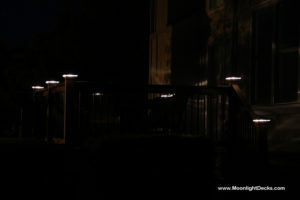 When you want to enjoy your evenings on your deck longer and with more safety, add outdoor deck lights. They can give you that attractive look you have been wanting while providing function and purpose for everyday use. 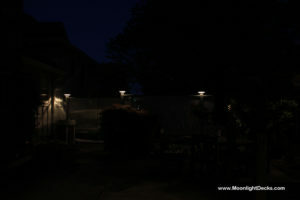 Contact Moonlight Decks LLC for a variety of outdoor deck lights that will work with your deck layout. 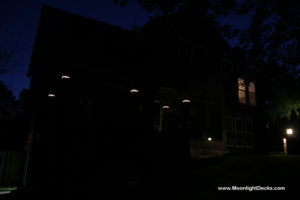 We offers a series of styles and configurations of outdoor deck lights that can be installed on virtually any deck type. How Can Lighted Post Caps Protect Your Deck? 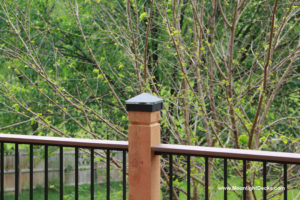 Over time, the look of your deck can deteriorate. It can begin to fade from its former glory and show signs of age. You can help prevent this wear from occurring by adding lighted post caps in to your deck’s wood end caps. Not only will this prevent weathering, it will also prevent rot from occurring, extending the life of your deck as well as improving its overall appearance. 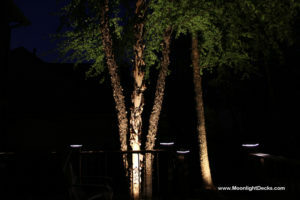 While lighted post caps are an attractive option to add to your outdoor deck, they also work to increase how it ages and wears over time. It seems that almost all decks have the same problem with the weather taking a toll on certain areas. You most often see your end caps cracking and rotting, showing age that is just not appropriate for how long you have had your deck. You can stop the rotting of your wood end caps by installing lighted post caps over them. 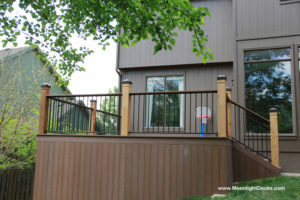 Their metal design is perfect to protect the wood underneath, as they don’t allow water and moisture to build up on the wood end caps, which is what leads to the damage you most often see in decks. This added protection will give your deck a longer lifespan and ensure it looks as good as the day you built it. Plus, because they illuminate, you’ll also add a great lighting feature to your outdoor space. The weather can take a toll on your deck, especially the end caps that always seem to show signs of wear. Whether it’s rain, snow or the sun that is creating this damage to your deck, lighted post caps can work to prevent this. They are placed right over these sensitive areas to give them a shield against the elements. Their easy installation makes them the ideal fix for slowing down weather-related wear to your deck, which can make the difference between a deck that looks aged and one that is stylish and functional. 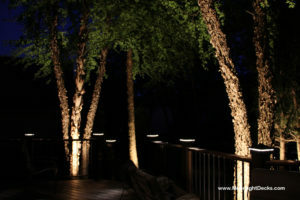 With lighted post caps, you’ll be able to enjoy your deck for many years to come, as it will have protection against the weather in the areas that need it the most. 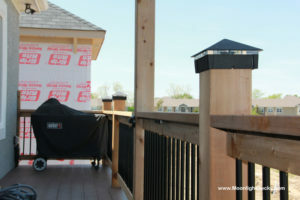 By placing these lighted post caps on your wood deck end caps, you will allow rain and moisture to roll off and provide a layer of protection against the sun. You won’t have to worry anymore if your deck is losing its life, as these lighted post caps give you an additional safeguard against damaging weather. 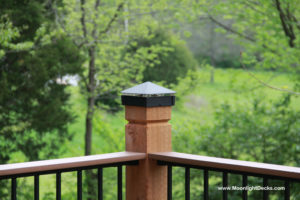 To maintain the look and appearance of your deck, install lighted post caps to its wood end caps. 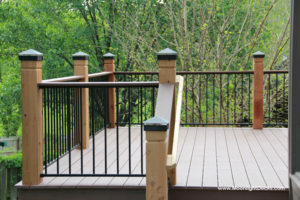 This will help prevent rotting and give your deck extra protection against weathering. 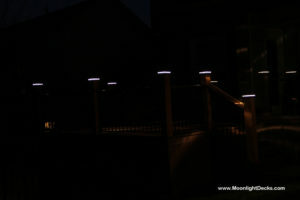 To purchase lighted end caps for your deck, contact Moonlight Decks LLC. 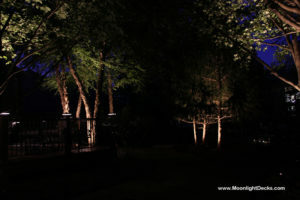 We have a large range of lighted end cap styles and colors that you can choose from to stylize and protect your deck. Author Steve Hodes JrPosted on September 5, 2016 February 2, 2017 Categories Deck Lighting, Deck LightsLeave a comment on How Can Lighted Post Caps Protect Your Deck? 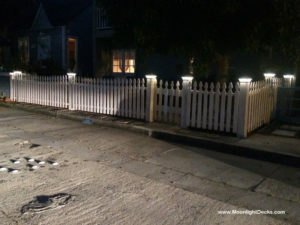 Here’s a couple pictures of our lighted post caps on a fence in Hermosa Beach. They used the white post caps with 6″ base. We installed our smooth black wrinkle lighted post caps / deck lights on this new deck built by All Weather Decks in Kansas City. The black post caps match the black handrails and go really well with the spiced teak composite deck. We used post sleeves on the handrail so we just dropped the wires down and made the connections under the deck and out of sight. 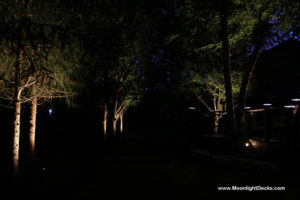 We also installed low voltage landscape lighting on the trees in the back of the yard which gives it a lot of depth and spectacular lighting. These pictures don’t really do it justice, but it looks great! 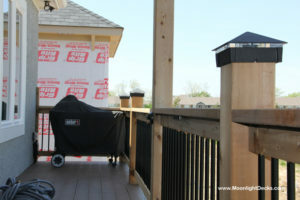 This is a new Azek deck built by All Weather Decks in Kansas City. 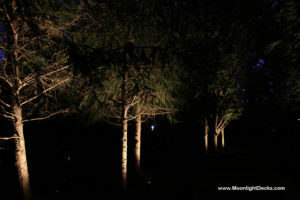 6×6 cedar posts with new black, lighted post caps. 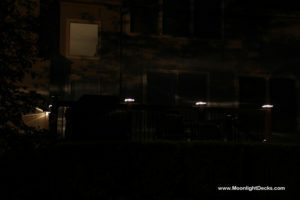 We added 6 deck lights to cap it off. 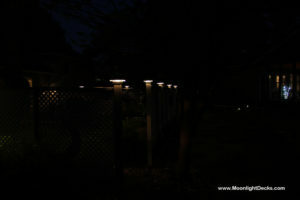 We installed new deck lighting on a privacy fence in Overland Park, KS. 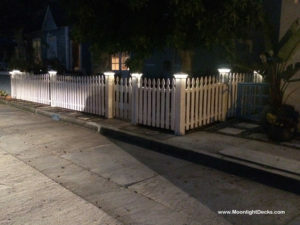 Our Silver Vein lighted post caps with 3.5″ base matched the color of the fence very nicely. 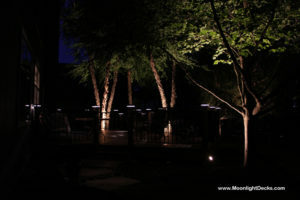 They put out just the right amount of light and really add to the ambience of the back patio. And also add great security to the back of the home.